The gentle rocking motion of a hammock helps you fall asleep faster than a stationary bed. This was tested by a group of Swiss scientists using 12 participants in gently rocking beds vs stationary ones. Every single participant fell asleep faster when gently rocked back and forth. They theorize this is because it mimics the way we were gently rocked by our mothers as babies. Hammocks alleviate pressure points. In a traditional mattress, no matter how hard or soft the weight of your non-flat body pressing down on a flat surface causes certain areas to receive more pressure than others. Constant tossing and turning only makes the discomfort worse. 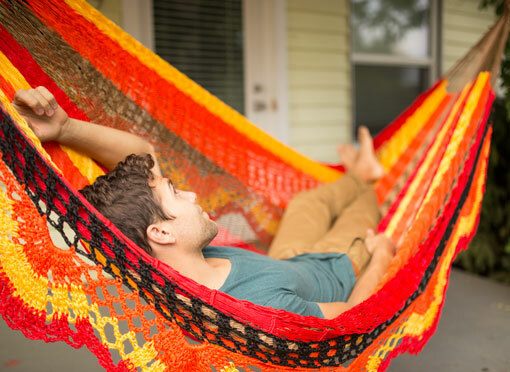 In a properly woven hammock the strings stretch and conform to your weight and shape. The result? Reduced pressure points and less back pain in the morning. Ever wonder why hospital beds recline? By raising your head and neck you experienced improved circulation and blood flow. The ideal angle is when your head and neck are raised 10 – 30 degrees, exactly the angle you enjoy sleeping in a hammock. Improved circulation and deeper, longer sleep means your white blood cells have more time to both fight off illness and prevent sickness ahead of time. Literally. The same 10 – 30 degree incline enjoyed in a hammock helps open up your breathing passageways for better oxygen flow. The increased oxygen helps you get over illness and helps your sore muscles recover faster. Hammocks can literally make you smarter. By giving you more time in the N2 sleep phase (see point 2 above) your mind not only gets more rest but is also aided in consolidating your memory functions. Scientists even theorize that sleeping in a hammock may help brain damage victims be able to recover more fully. Worried about bedbugs or other critters? A hammock is a great way to escape from their reach. One of the practical early uses of hammocks was in fact just that: to stay safe from snakes, rodents and other pests. Live in a cramped apartment? Or just want more free space in your room? A hammock is a great way to open up you living space. Simply drill two holes in your wall studs to hang your hammock and when you wake up each morning take the hammock down and fold it up. You’ll love all the open space! Unless you still live with your mom, you have to fold your sheets each morning and wash them once a week. Not with a hammock! If you still feel like washing it however, we have simple directions, here. Sleeping in a hammock full time or even taking regular naps in them is a great idea. Just don’t do it in a crappy hammock. Any hammock you intend to sleep in should be: large, comfortable, and free of a spreader bar. Any of the Lazy Bandido hammocks will work great as a part time or full time bed replacement.